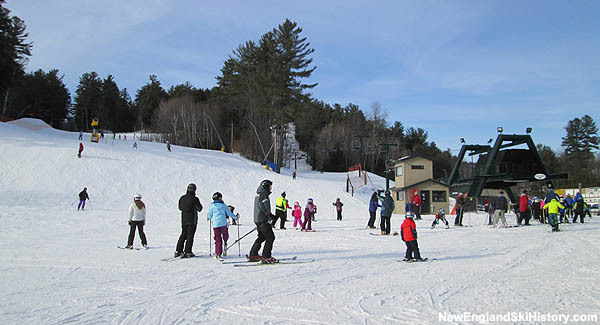 Located between the New Hampshire Route 16 corridor and the Maine border, King Pine has long been a popular destination for local skiers and Purity Spring Resort guests. Prior advent of lift served skiing, the establishment of three entities paved the way for the creation of King Pine. Circa the late 1800s, Edward Hoyt created the Hoyt Natural Spring Water Company, which shipped bottled water to regional cities. By 1902, Edward Hoyt and M. H. Hoyt were advertising Purity Spring Farm vacation cottages in Boston papers with the claim of the "purest water in the world." In 1932, Hoyt's son Milt opened a boys camp on the property, which would eventually be named Camp Tohkomeupog ("Camp Tohko"). Downhill skiing was added as an activity for Camp Tohkomeupog in 1938, when a small rope tow was installed below Bald Ledge. Initially a rope tow powered by Ford Model A work trucks (reportedly tied to trees and put on blocks for the winter), the ski operation grew from a part time endeavor to a larger, multi-tow operation after Purity Spring Resort became a full time, year round operation in the mid 1940s. Up to 4 tows may have operated at the same time, with one reserved for family and friends. 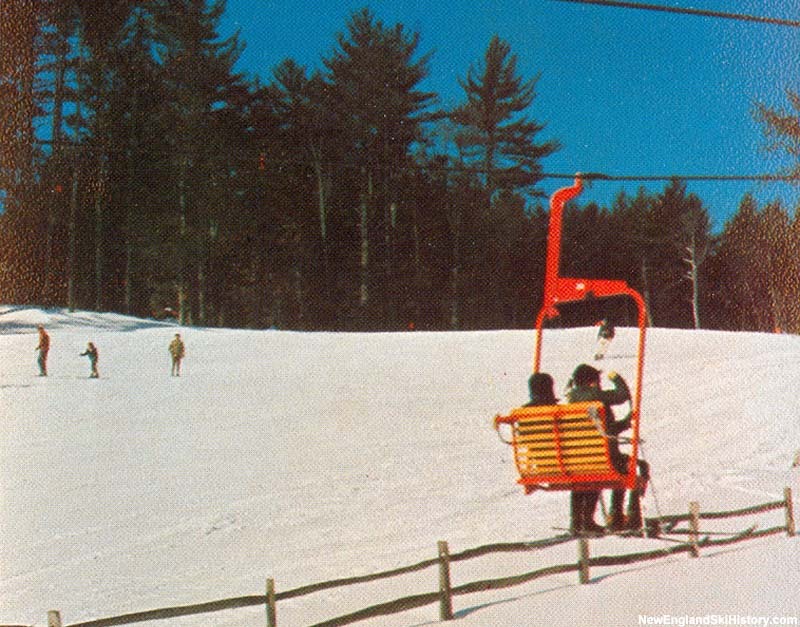 In the midst of the lift served skiing boom of the 1960s, Purity Spring Resort constructed a larger ski area on the opposite side of East Madison Road in 1962. 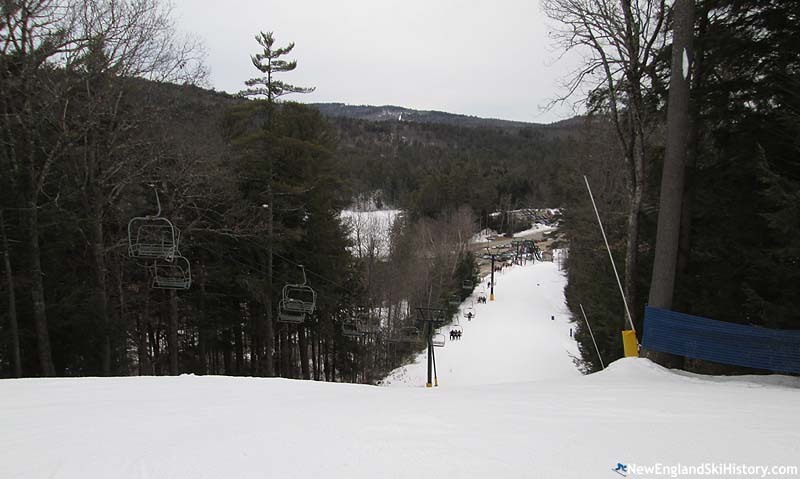 Serviced by a double chairlift, the new King Pine ski area initially consisted of 3 trails and an open slope. The Purity Spring rope tow operation overlapped with King Pine for one season. A remaining rope tow may have operated for guests periodically into the 1970s. The King Pine was nearly doubled in size in 1968 when the North Side area was developed. In addition to boosting overall skiable acreage and uphill capacity, the new complex gave King Pine legitimate steep expert terrain. Snowmaking was likely added in the mid 1970s. In 1976, Milt handed the day to day management duties down to his children, Ted, Laura, Bob, and Susie. Chairlift served night skiing may have commenced in 1982-83, initially on weekends and vacation weeks. In subsequent seasons, night skiing was expanded to more trails and nights and has become a key part of operations. Starting in 1987 with the installation of the Polar Bear triple chairlift, King Pine underwent a steady campaign of modernizing its infrastructure. Following the closure of King Ridge, King Pine acquired a modern CTEC triple chairlift. Portions of it were used to install the Powder Bear Triple in 1996, followed by the Black Bear Triple in 2006. At that point, each main lift had been upgraded to a modern, higher capacity triple chairlift. Non skiing offerings were expanded for the 1997-98 season, when a snow tubing facility opened. For the 2017-18 season, King Pine replaced nearly a mile of 3" snowmaking pipe with new 4" pipe, providing additional water to an enlarged fleet of snowguns.